In primary school I loved Louis Untermeyer’s Golden Treasury of Poetry especially the limericks and ‘The Highwayman’. There’s a fair bit of a lull after that until my brother passed away and then I turned a lot to The Oxford Book of English Verse – particularly Thomas Hood’s ‘The Sea of Death’. A few years back I discovered the Bloodaxe ‘Staying Alive’ trilogy which opened up a whole new world of modern poems and poets, particularly shorter ones. (Poems that is). I started writing more seriously about this time. Favourite writers would be Carol Ann Duffy, Wislawa Szymborska, Stephen Dunn and especially Alden Nowlan – a Canadian genius and earthy, accessible poet. I think that first of all I write for myself. I have discovered that quite often the poem is telling me something about myself that I couldn’t get to another way – a sort of self-therapy I guess. If I’m writing about an idea or a feeling it’s a way of turning it over and looking at all the edges. Sometimes it’s the poem that tells me how I’m feeling. After that though I definitely enjoy sharing (mostly) the poem with others and seeing if it touches some vital part of being human. It’s a real kick when others find layers of meaning that I was unaware of or hadn’t really intended. Some are written just to be enjoyed, a bit of a laugh or even more visceral. A few to provoke though this rarely raises much angst. I find this quite a difficult question. As none of my poems have (yet!) been published I had quite a few to select from for the competition. I have submitted to a few journals and competitions, as yet unsuccessfully, so I found it really hard to gauge which poems I should put in – actually I think I got a little cavalier with the entry. I think ‘Mercury’ fell into place as the last to be picked as it’s one of the earliest poems I wrote and got excited about. I love the word Mercury so much I’ve written several poems all with that title but the one I’ve included is the original. I’ve found that poems come to me in quite different ways. Usually the best or at least easiest to write is when a first line comes out of the blue, closely followed by the last line. I’m not sure exactly what the prompt in these instances is, whether a scene or a feeling or just a thought. Perhaps a glimpse into someone’s life. Then there are poems that start with an idea or a feeling I want to convey. These are a little harder to write but if the idea or feeling is quite solid they carry through and if they don’t they often morph into something else. I love it when the poem ends with so much more than it started with. I have also written a few poems to a particular theme (one was borders) – these are usually a little slower to start but once momentum kicks in they get there. There’s a lot of polishing that goes on. It’s a real high when a poem is finished. So I think you mean if I could detach myself from the poems in a sort of impartial way? In that case variety, accessibility and aftertaste. Carol Ann Duffy, Paul Muldoon, Carolyn Forche, Stephen Dunn, perhaps John Burnside. Would have loved to have heard John O’Donohue live but at least we have Youtube. Stuart Airey graduated in Optometry from Auckland University in 1986 and has worked in this role for over 30 years. He also has a post-graduate Diploma in Theology from Laidlaw College. He is married with three children and lives in Hamilton. Apart from dabbling in short stories in high school Stuart began writing poetry more seriously after the Christchurch earthquake which resonated with personal loss in his family. Stuart has enjoyed performing some of his poetry in a series of dedicated evenings featuring a mix of drama, audio-visual, lighting and special effects. His poems are currently unpublished and he feels he is very much on the threshold of an unknown yet inspiring path. 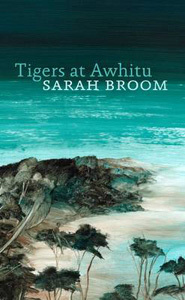 The four finalists will read from their work at the Sarah Broom Poetry Prize event at the Auckland Writers Festival on Sunday 20 May, 3.15-4.15pm. This entry was posted in NZ author, NZ poems, NZ poetry, NZ poetry event, Uncategorized and tagged Sarah Broom Poetry Prize, Stuart Airey on May 8, 2018 by Paula Green. waiting to take our turn to kneel at that mouth. I have always admired truth-tellers: Anne Sexton (The Awful Rowing Toward God), Raymond Carver (All of Us), Denis Johnson (The Throne of the Third Heaven of the Nations Millennium General Assembly), Dorothea Lasky (Thunderbird), Sharon Olds (Satan Says), Rachel Wetzsteon (Sakura Park), Claudia Rankine (Don’t Let Me Be Lonely), Douglas Wright (Laughing Mirror), Alice Anderson (Human Nature). To name a few. One of my favourite poets at the moment is a Lovelock Paiute writer from Nevada, Adrian C. Louis (Ceremonies of the Damned), who blows my hair back, and makes me laugh out loud! He speaks such truths, I am in awe of him. I also recently loved Michel Faber’s first book of poems on the subject of his late wife’s struggle with cancer: ‘Undying’. Brilliant book. I am waiting to receive (through the mail) the Collected Poems of Jane Kenyon. Sharon Olds has said that she wants her poems to do something useful. I agree with that. I want my poems to be brave, to connect, to surprise. I want to trust my voice, to resist self-censorship; to learn something each day about my own drama, as I learn each day from other poets. A journey of surprise and discovery. I suppose a poem like: ‘Mania Come Back!’ which goes against the grain of the prevailing idea that the stable world is the desired world. It’s a poem that grinds against the flat plane of balance. I read poetry every day, and often other people’s writing is a trigger. Not only poetry but articles, essays, interviews, world news, movies, etc. And of course lines come up from “nowhere” and set the thing off. Wes Lee is the author of Body, Remember (Eyewear Publishing, 2017), Shooting Gallery (Steele Roberts, 2016), and Cowboy Genes (Grist Books, University of Huddersfield Press, 2014). Her work has appeared in the Poetry New Zealand Yearbook 2018, New Writing Scotland, Westerly, The London Magazine, Landfall, Cordite, Poetry London, Irises: The University of Canberra Vice-Chancellor’s Poetry Prize Anthology 2017, and many other journals and anthologies. She has won a number of awards for her writing including the BNZ Katherine Mansfield Literary Award; The Short FICTION Writing Prize (University of Plymouth Press); The Bronwyn Tate Memorial Award. She is currently working on her third poetry collection, By the Lapels. This entry was posted in NZ author, NZ poems, NZ poetry, NZ poetry event, Uncategorized and tagged Sarah Broom Poetry Prize, Wes Lee on May 5, 2018 by Paula Green. 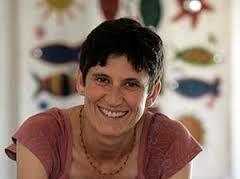 Entries are now open for the inaugural Sarah Broom Poetry Prize. Poets (both emerging and established) are invited to send in 6 to 8 poems (of which at least 5 must be unpublished). 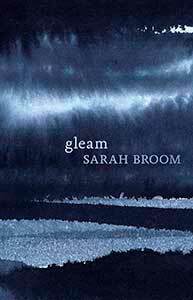 The Sarah Broom Poetry Prize is inspired by the spirit of imagination, freedom and determination that marked Sarah’s life and work. 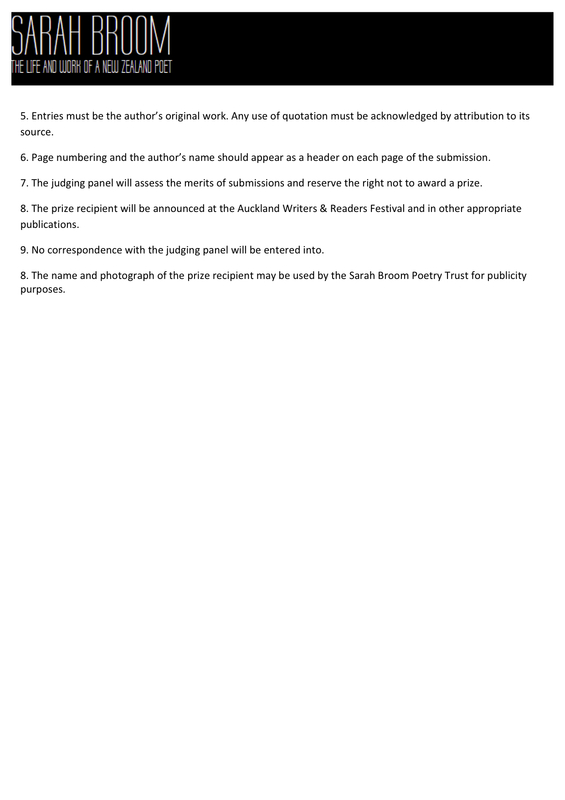 The prize aims to provide recognition for a New Zealand poet and a financial contribution to support their work. The prize will be awarded annually, based on 6-8 unpublished poems, to encourage and support the recipient in the completion of a full manuscript of original poetry. 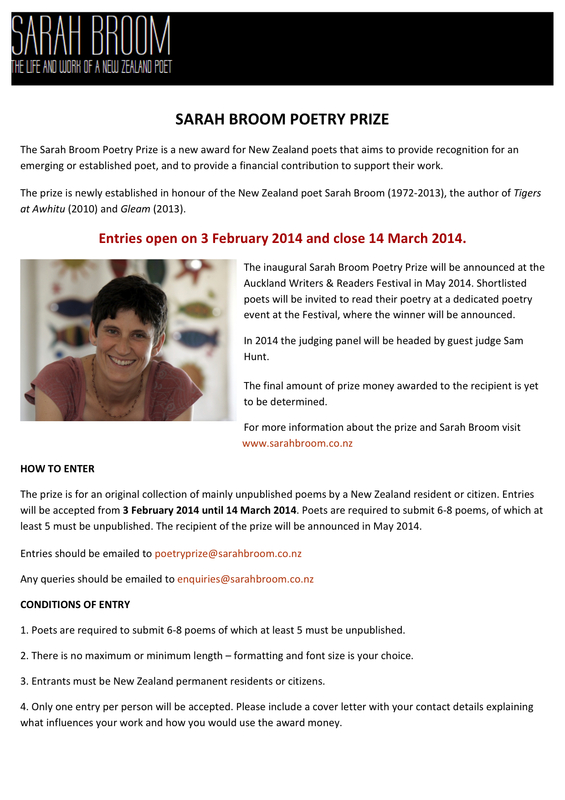 Entries for the Sarah Broom Poetry Prize open on 3 February 2014 and close 14 March 2014 and the inaugural Sarah Broom Poetry Prize will be announced at the Auckland Writers & Readers Festival in May 2014. Shortlisted poets will be invited to read their poetry at a specific poetry event at the Festival. Fundraising for the Poetry Prize is now underway and will determine the final amount awarded to the recipient. If you would like to contribute to the fund please make a donation with your credit card or internet banking via PayPal. This entry was posted in Poetry Awards and tagged Sarah Broom Poetry Prize on February 7, 2014 by Paula Green. This entry was posted in Poetry, Poetry Awards and tagged Sarah Broom Poetry Prize on December 9, 2013 by Paula Green.